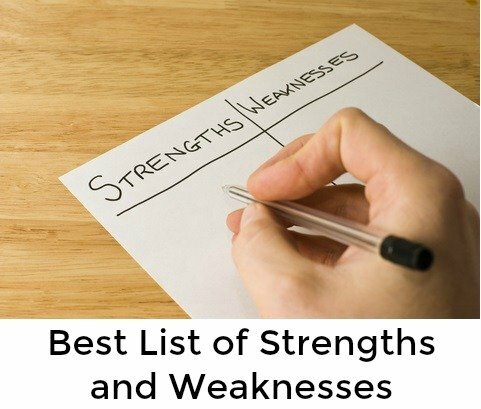 This list of strengths and weaknesses helps you to recognize those that apply to you. Know how to present these employee strengths and weaknesses in the best way when answering interview questions. 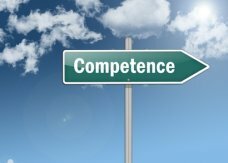 Identify your top transferable competencies from your previous work and life experience and provide the right answer to the frequently asked interview question "What are your strengths?" What are the skills and behaviors that you need to work on and improve? Everyone has a fair number of these! 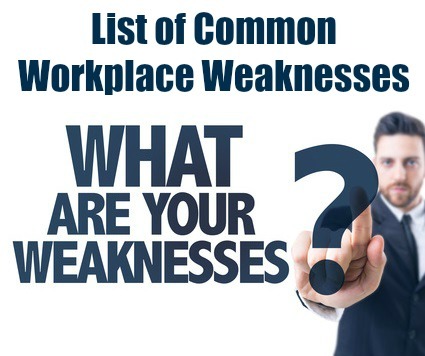 Employers want to know how you manage the weakness and recognizing the weakness is the first essential step to managing it properly. This complete list of strengths and weaknesses and how they present in the workplace will help you do this. Communication Written communication skill evident in reports, correspondence. Verbal communication skills evident in presentations, managing conflict, selling, dealing with customers, active listening, meeting participation and negotiation. Strong work ethic/diligent Hard working, works extra hours, completes projects before time, takes on more than others, does more than required, maintains a high quality of work, imposes own standards of excellence, works without supervision, follows up on own. Organizational and planning skills Evident in time management, prioritizing, using resources effectively, meeting deadlines, multi-tasking, dealing with competing demands, achieving objectives and goals, setting targets, maintaining schedules and calendars, optimal use of available resources, coordination of resources to complete projects. Decision-making/judgment Gather the necessary information to make a sound decision, come up with viable alternatives, consider pros and cons for each, fully commit to the best action, follow through on decision. Problem solving Able to identify and define problems, analyze problems to find causes, find possible solutions, consider the possible outcomes of each solution, decide on the best solution and implement it. Gathering, analyzing and managing information Collect required information efficiently from different sources, integrate information and put it together in a logical format, process information, identify trends and patterns, distribute and communicate information correctly, store and maintain information efficiently. Coaching/mentoring Willing and able to coach others, enable and facilitate learning, impart knowledge, help people to identify and achieve what they are capable of, assess training and learning needs, develop appropriate learning interventions, adapt teaching/coaching style to meet employee's needs. Reliable/dependable Consistent work performance, complete projects accurately and within deadlines, arriving on time, fulfilling obligations, following through on commitments, checks own work, corrects own work, complies with workplace policies and procedures, takes responsibility for own actions. Self reliant/ self management Uses own resources, skills and abilities fully, accountable for own activity, progress and success, manages self towards goals, completes projects and activities independently, obtains own help and assistance, internally motivated and does not seek external rewards for good performance. Self discipline Controls own behavior, self-motivated, prepared to work hard to achieve goals, sets own targets, avoids distractions, perseveres with difficult tasks and activities, does not procrastinate, continues with projects in the face of obstacles and challenges. Persistent/resilient Handle disappointment, deal effectively with rejection, stay enthusiastic after a set back, maintain work performance despite difficulties, accept criticism, bounce back quickly, overcome obstacles to achieve, keep trying until task is completed. 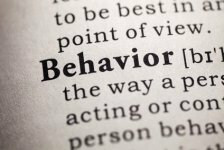 Persuasive Evident in selling, customer management, negotiating, dealing with objections, getting agreement/commitment from co-workers/management, presenting ideas, motivating people, gaining the confidence of others. Integrity Maintain confidentiality, provide complete and accurate information, observe company policies and procedures, comply with regulations, maintain values and ethics in the face of opposition and pressure. Energetic Works long hours, maintains fast work pace, tackles challenging tasks, stays positive, takes on extra tasks, maintains high productivity levels, tenacious in achieving goals. Initiative Proactive attempts to sort out problems and issues, provide ideas for improvement, make full use of opportunities, identify needs and come up with solutions, take steps to make your job and the company better. How do you answer "What is your greatest strength?" 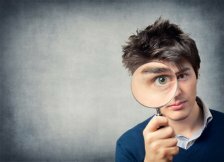 Understand your own strengths using the strengths finder at What are your Strengths? 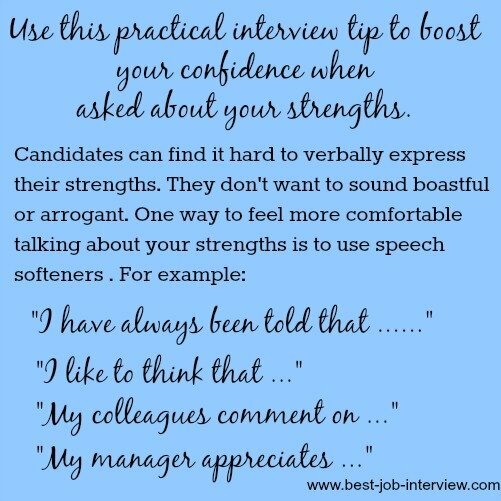 Top sample interview answers to "What are your strengths and weaknesses?" Use the list of strengths and weaknesses to successfully answer common job interview questions.